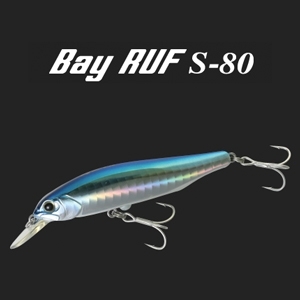 Designed specifically for bay and estuary fishing, the Bay Ruf S80 incorporates a magnetic casting weight transfer system to deliver long, tumble-free casts. The low centre of gravity (see the weight protruding from the belly) combined with a strengthened lip is designed to deliver a strong rolling action, even on the pause the lure keeps rolling as it drops down. Ideal for use where bait is being smashed on the surface - cast to the edge of the bait school and let it drop with a twitch every few seconds.